1. General Information: All Passengers using the services of Balloon Aloft Gold Coast, booked either directly or indirectly via a booking agency, do so and accept all Balloon Aloft Gold Coast terms & conditions as advised below, briefly on Balloon Aloft Gold Coast brochure and in full on Balloon Aloft Gold Coast website at www.balloonaloft.net A Flight Booking, Gift Certificate or Voucher entitles you to participate in a hot-air balloon flight with Balloon Aloft Gold Coast. Please phone our booking office for any information or bookings. Bookings are essential. Contact: Ph: 61 (07) 5578 2244. Telephone & Internet Office hours are AEST 8.00 am to 8.00 pm Monday to Sunday. When you book, purchase or redeem a Balloon Aloft Gold Coast Hot Air Balloon Flight, Gift Certificate, Voucher or Package deal, you understand and accept Balloon Aloft Gold Coast terms and conditions. You become legally bound by these terms and conditions. Please do not proceed to book, purchase or redeem a Gift Certificate or voucher for a Balloon Aloft Gold Coast hot air balloon flight until you have read, understood and accepted the terms and conditions. By paying for and accepting supply of the Service, you agree to be bound by these conditions. If you do not accept these conditions you should contact Balloon Aloft Gold Coast immediately and prior to accepting supply of the Service. 2. Definitions Service refers specifically to the hot air ballooning mentioned on this documentation and generally to the range of products Balloon Aloft Gold Coast provides, including accommodation and customised activities arranged by agreement. Service Operator refers to Balloon Aloft Gold Coast or any independent contractor supplying/delivering the services to you under your Agreement with Balloon Aloft Gold Coast. Individual Passenger Booking – refers to a booking of 3 people or less booked at the same time, in the one scheduled flight date. Group Passenger Booking – refers to a booking of 4 or more people booked at the same time, in the one scheduled flight date. 3. Liability Under no circumstances will Balloon Aloft Gold Coast be liable for direct, indirect, consequential or incidental damages including but not limited to lost or damaged property, lost profits or savings or damages for disappointment. Balloon Aloft Gold Coast may arrange for the hot air ballooning to be performed under a ‘code-sharing’ arrangement, i.e. it may subcontract another ballooning company to provide you with your flight. In such instances, Balloon Aloft Gold Coast accepts no liability in connection with such services or for any loss, injury, or damage to or in respect of any person or property. Balloon Aloft Gold Coast reserves the right to alter contents of products and location when deemed necessary. Balloon Aloft Gold Coast does however warrant providing services of equal nature and value. 4. Prices: - Prices quoted are valid from 1st April 2009 until 31st March 2010. Pricing after 31st March 2010 is available from the company upon request. Due to operational issues, Balloon Aloft Gold Coast reserves the right to alter all itineraries and / or fare details, and choice of balloons. We reserve the right to change prices without notice. All prices are in Australian dollars (AUD$), and include Goods & Services Tax (GST) at the current rate of 10%. 5. Payment methods: - can be cash, cheque, money order, valid credit card (MasterCard, Visa or Amex), bank direct deposit or an approved voucher. Please note, to cover credit cards surcharges, wire transfers, bank and currency exchange rate fees, additional charges may apply. Payment by way of AMEX card will attract a 4% surcharge for processing. This surcharge is non-refundable in the event of a trip cancellation. 6. Bookings: - Full payment or a holding deposit of 50% of the total booking value, at least 14 days prior to your flight, will confirm your booking. Full payment is required within 7 days prior to your flight date. Passenger’s names, estimated weights in kilograms and after hours contact or mobile phone number will be required for booking and flight manifest purposes. 7. Weather, Mechanical, Staffing & Other Safety Conditions Hot air ballooning relies on suitable weather conditions in order to proceed safely. Information on specific weather considerations are provided for at the time of making the booking. Additionally, flights may be dependent on mechanical performance or staffing availability. When conditions are deemed by Balloon Aloft Gold Coast to be unsuitable or unsafe to proceed, then trips may not go ahead on the scheduled date. Similarly a trip may be postponed due to less than minimum numbers being achieved. It may be necessary to postpone a flight at any time, if in Balloon Aloft Gold Coast judgment the conditions are not suitable. We reserve the right to cancel a flight at any time up to the moment of launch. In the unfortunate event that a flight must be delayed, rescheduled or cancelled due to any of the above factors, Balloon Aloft Gold Coast will hold payment in credit and offer alternative booking dates (see section 8). If you are on a ‘balloon package’ and the flight is cancelled due to any of the aforementioned reasons, the accommodation / meals / transfer portion of the package, if used, must be paid. Balloon Aloft Gold Coast will not accept any liability for travel, accommodation, inconvenience or other costs incurred or lost through such cancellation. International, interstate and country visitors should factor the possibility of short notice cancellation into their plans. Weather conditions can also affect the duration and route of all flights in all locations. Balloon Aloft Gold Coast endeavour’s to give each passenger the best ballooning experience possible, subject to the daily wind and weather conditions. With passenger’s safety always at the forefront of pilots concern, a flight altered in route, or landing earlier than anticipated, will be deemed as a completed flight for that day provided the flight is more than 40 minutes duration (for a one hour flight) or 20 minutes (for the 30 minute flight). 8. Flight Alteration & Cancellation of a Booking: (a) In the unfortunate event you should have to alter or cancel your booking, certain fees apply: i) Individual Passenger Booking (1 – 3 passengers) • Any flight cancelled within 72 hours prior to flight date will forfeit the full fare per person and will not be refunded. • Any flight altered within 72 hours will be at the discretion of Balloon Aloft and dependent upon flight availability. • All alterations to flight date will incur a rebooking fee of $25.00 per person. • Any flight cancelled outside of 72 hours of flight date will incur a cancellation fee of $50.00 per person. • Missed flight: If you fail to show up for your flight or do not arrive in time for the flight and you miss your scheduled flight date; the full flight fare (100%) is forfeited and no rebook or refund will be made. You may send someone else in your place if you wish – please notify us the name and estimated weight of any replacement person (this is at the sole discretion of Balloon Aloft). The company has the right to retain all deposits received up to the amount of the cancellation fee and invoices will be issued for any further amounts outstanding. If we are holding a credit card for security and you alter, cancel or miss the flight, the credit card will be debited and/ or invoices will be issued for any further amounts outstanding. You cannot receive a refund on any trips booked with a gift certificate. (See Section 12) ii) Group Passenger Booking (4 or more #1). • Any flight cancelled within 7 days prior to flight date will forfeit the full fare per person and will not be refunded. • Any flight altered within 7 days will be at the discretion of Balloon Aloft and dependent upon flight availability. • All alterations to flight date will incur a rebooking fee of $25.00 per person. • Any flight cancelled outside of 7 days of flight date will incur a cancellation fee of $50.00 per person. • Missed flight: If you or any member of your group, fails to show up for the flight or do not arrive in time for the flight and miss the scheduled flight date; the full flight fare (100%) is forfeited and no rebook or refund will be made. You may send someone else in your place if you wish – please notify us the name and estimated weight of any replacement person (this is at the sole discretion of Balloon Aloft). The company has the right to retain all deposits received up to the amount of the cancellation fee and invoices will be issued for any further amounts outstanding. If we are holding a credit card for security and you alter, cancel or miss the flight, the credit card will be debited and/ or invoices will be issued for any further amounts outstanding. You cannot receive a refund on any trips booked with a gift certificate. (See Section 12) #1 Note: Separate cancellation and alteration provisions apply to large groups and customised events. These are specified on the group booking documentation supplied. Balloon Aloft Gold Coast reserves the right to amend these fees and notice periods. When special circumstances arise, some of these Terms and Conditions may be superseded by those published on your booking confirmation documentation. (b) If your flight has been cancelled by Balloon Aloft Gold Coast due to inclement weather or flight safety conditions (see section 7), please contact our booking office as soon as possible to rebook. Your booking details will go into "open dated" status in our bookings system, and the validity date is automatically extended for 3 months. We do ask that you contact us within 90 days to arrange another flight. If the rescheduling of the flight exceeds 90 days, and if there is a price difference since the initial booking date, an adjustment and additional fare payment may be necessary. Rebooking must be done within 12 months of the first cancelled flight date. If rebooking the flight is not possible due to special circumstances such as travel arrangements or medical issues, refunds may be given upon request. There will be no refunds for bookings held on our system for longer than 6 months. Refunds may incur a $25.00 administration fee. You cannot receive a refund on any trips booked with a gift certificate. (See Section 12) c) If your flight booking or travel voucher has not been purchased directly from Balloon Aloft Gold Coast, but from another party such as a travel booking agent, tour operator or online experience booking service, then that parties conditions of purchase will also apply. 9. Passengers Responsibility (a) It is the passengers responsibility to advise Balloon Aloft Gold Coast, no later than 48 hours prior to the scheduled balloon flight, the passenger’s names, estimated weights in kilograms and after hours contact or mobile phone number (to be switched on) for flight manifest and contact purposes. (b) It is the passenger’s responsibility to ensure they/you arrive at the designated meeting place prior to the advised meeting time. You should have received booking confirmation details of your flight; please notify the Balloon Aloft Gold Coast office immediately and prior to your flight date if you do not have this information. You are also required to follow the check-in procedure outlined in the confirmation letter the evening before your flight. If you do not contact the confirmation number (0400 40 40 22) as required between 6.00 and 7.00 p.m., Balloon Aloft Gold Coast cannot be held liable for the consequences of not checking in with your pilot and receiving the latest instructions. (c) In the interests of safety, passengers undertake to follow the advice of the pilot and ground crew, comply with any local codes of conduct and act sensibly and prudently at all times. Passengers also agree to indemnify Balloon Aloft Gold Coast, its owners, officers and employees for all losses and/or damage arising from any act or default on your part or the part of a member of your party. Under no circumstances at any time during supply of the Services should you or a member of your party be under the influence of drugs or alcohol, nor should you take medication that could affect or impair your judgment at this time. (d) Check with your medical practitioner if you have a pre-existing medical condition that may be affected by the physical nature of hot air ballooning. You agree to indemnify Balloon Aloft Gold Coast, its owners, officers and employees against any incident related to your health occurring during or after supply of the Services. (e) Balloon Aloft Gold Coast requires each passenger to sign a standard Balloon Aloft Gold Coast ‘Registration, Medical Check & Notification of Risk Form before the flight. When you sign this, you are operating under Balloon Aloft Gold Coast Australia Air Operators Certificate SQ532306, issued by the Civil Aviation Safety Authority of Australia. Passengers will be briefed and given safety instructions on the day. This includes take off & landing positions (f) Personal belongings taken on board at the passenger’s own risk. (g) Ballooning is an outdoor adventure activity, and Balloon Aloft Gold Coast cannot be held liable for damage to any clothing and/ or other personal property. Suitable clothing, a hat and fully enclosed sturdy footwear must be worn. No thongs or high heels allowed. 10. Entry Restrictions. a) Weight notification: Balloon Aloft Gold Coast will require, for flight manifest purposes all passengers’ names and estimated weights (in kilograms). b) Minimum Age Requirement: Children ages are between 3 to 14 years. Children are welcome and must be accompanied by a paying adult. Infants are not permitted due to the Civil Aviation and Safety Authority (CASA) regulations and guidelines. Adult prices will apply from age 15 years and upwards. c) Disabled passengers are able to balloon, although limitations do apply due to the Civil Aviation and Safety Authority (CASA) regulations. CASA requires that all passengers are able to embark and disembark a balloon basket unassisted for safety reasons. No wheelchair facilities are available. Disabled persons participating in the balloon flight do so at their own risk and the company accepts no liability for any damage or injury caused. As the flight is for approximately 1 hour, passengers must be able to stand unaided for the duration of the flight. (i.e. : no additional aids such as seats, walkers, sticks or crutches are permitted in the basket). If in doubt, an able bodied person (friend or relative) must accompany the "slightly infirm" passenger. d) Pregnant women. Regrettably under the Civil Aviation and Safety Authority (CASA) regulations and Balloon Aloft Gold Coast' policy we do not fly women who are over 12 weeks pregnant. e) Diving: Those persons diving the day or night before travel should check with a qualified dive master regarding their ballooning journey. We do not fly above 4,500 feet altitude and most flights are around 2,500 feet altitude. Passengers diving the day or night before travel who participate in ballooning do so at their own risk, and the company accepts no liability for any damage or injury caused. 11. Additional Booking Information a) Standard Ballooning Program: Please allow 3.5 – 4.5 hours for the balloon activity program, which includes the inflation, the flight, deflation & packing up, flight program transportation, and a restaurant champagne breakfast (if included) commemorative flight certificate presentation. Flight program, times and duration may vary slightly at the pilot’s discretion. b) All Ballooning Packages advertised on Balloon Aloft Gold Coast website, brochures and fliers include an option of approximately 30 or 60 minute flights. c) Days of Operation - Balloon Aloft Gold Coast operate daily, at sunrise, all year around with the exception of unsuitable weather or insufficient passenger’s numbers. d) Minimum Numbers - In the event that minimum numbers are not met, we reserve the right to reschedule your balloon flight for a later date (see Section 7). e) Group Passenger bookings: i) Refers to a booking of 4 or more people booked at the same time in the one scheduled flight date. ii) Group discounts will only apply to direct bookings with, and payment to Balloon Aloft Gold Coast booking office. iii) Group discounts may be wavered for exclusive group bookings from alternative and negotiated launch sites located over 50 kms from our pre-nominated meeting point. iv) Exclusive group bookings at alternative launch sites or regional centres will incur additional charges for associated travel, accommodation & staffing costs. v) Separate cancellation and alteration provisions may apply to large groups and customised events. These are specified on the group booking documentation supplied. vi) Group discounts do not apply to the purchase of gift certificates. 12. 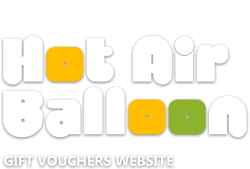 Balloon Aloft Gold Coast Gift Certificates/Vouchers – Terms & Conditions of Purchase & Use. 1. A Balloon Aloft Gold Coast Gift Certificate / Voucher is non-refundable. 2. Gift certificates are valid only when fully paid by the purchaser or distributor. 3. Gift Certificates are transferable to other individuals and are valid only for the period indicated thereon. If another gift certificate or voucher is to be issued, there will be a $25.00 administration fee. 4. Gift Certificates cannot be redeemed for cash or refunded in part or full. 5. Once the Gift Certificate has been redeemed (i.e. the trip date has been booked) all other terms relating to Alteration and Cancellation (see Section 7) apply, however the value remains non-refundable. 6. Balloon Aloft Gold Coast Gift Certificate and Voucher holders are bound by all Balloon Aloft Gold Coast conditions of travel & use including flight cancellation policies. 7. 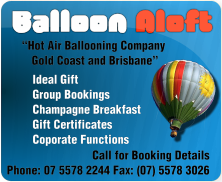 Balloon Aloft Gold Coast accepts no responsibility for lost, stolen or fraudulent Gift Certificates or vouchers. It is the holder’s responsibility to ensure the safe keeping of the voucher or gift certificate. No voucher, no flight. 8. A Gift Certificate / Voucher, is an open dated balloon flight, valid for 12 months (unless otherwise stated) from the date of purchase, and as per the expiry date nominated on the Gift Certificate or Voucher. 9. A Gift Certificate/ voucher once redeemed must be presented to the pilot on the scheduled flight morning. 10. Hot Air Balloon flights are a weather dependant activity and may be cancelled. It is the gift voucher holder’s responsibility to make as many attempts as possible to achieve a successful launch before the expiry date. 11. Gift Certificates/ Vouchers must be booked and used before the expiry date specified on the voucher. 12. Gift Certificate/ Voucher extensions are only granted under special circumstances, and only at the discretion of Balloon Aloft Gold Coast. Please note however, extensions attract administration fees, so it is in the gift certificate holder’s best interest not to let the voucher expire. 13. Should you need to extend the validity of your gift certificate beyond the nominated voucher expiry date, extension fees apply: i) If your Gift Certificate/ voucher has not yet expired, and you cannot take the flight before the expiry date, we can extend your voucher for an administration fee of $15 per month per person per voucher for a maximum of 2 months only. ii) If your Gift Certificate/ voucher has already expired and you contact us within 30 days (1 month) of its expiry date, we can extend your voucher for an administration fee of $30 per person per voucher for one month only. iii) If your Gift Certificate/ voucher has already expired and you contact us more than 30 days after the expiry of your voucher, the voucher cannot be extended under any circumstances. Expired Gift Certificates/ vouchers are non-refundable in whole or in part. 14. If your gift voucher or travel voucher has not been purchased directly from Balloon Aloft Gold Coast, but from another party such as an online experience booking service, a travel booking agent or tour operator, then that parties conditions of purchase will also apply. All transactions involving BALLOON ALOFT GOLD COAST are deemed to be made directly with the respective vendors of the products and services selected. For the ballooning sector this will be Balloon Aloft Gold Coast Aust. Pty Ltd trading as Balloon Aloft Gold Coast ABN 92 010 927 483. Air Operators Certificate Number SQ532306. For non-ballooning products / packages will be with third parties as stated. BALLOON ALOFT GOLD COAST is not the principal or agent for the vendors and package partners and shall not be involved in any claim or dispute or be liable for any loss or damage that may arise in relation to such transactions. BALLOON ALOFT GOLD COAST does not warrant the accuracy, completeness, suitability or reliability of any information, service or product listed at BALLOON ALOFT GOLD COAST website. Under no circumstances, including negligence, shall BALLOON ALOFT GOLD COAST be liable for any loss, claim, or any direct, indirect, incidental, special or consequential damages (including but not limited to lost profits or lost savings) which arises out of or is in any way connected with the use of any information, any listing of any data at BALLOON ALOFT GOLD COAST or any delay or inability to use this web site whether based on tort, contract, strict liability or otherwise. Jurisdiction In states or jurisdictions where exclusion or limitation of liability for direct or consequential or incidental damages are not allowed, BALLOON ALOFT GOLD COAST' liability shall be limited to the greatest extent as may be permitted by law and all use is governed by the prevailing law in Queensland, Australia and this is implicitly acknowledged. This web site may contain links to other sites maintained by third parties. BALLOON ALOFT GOLD COAST is not responsible for and does not operate or control any information or services provided on such third party sites. The links are provided solely for convenience and do not constitute an endorsement by BALLOON ALOFT GOLD COAST. BALLOON ALOFT GOLD COAST reserves the right to revise the terms and conditions contained herein. Visitors to the site shall be responsible for reviewing such terms and conditions regularly and the continued use of the web site following changes made shall constitute acceptance of such amended terms and conditions. The compilation of the information contained herein is copyrighted and may not be modified, copied, distributed, transmitted, displayed, reproduced, published, licensed, used to create derivative works from, transferred, or any information, services or products obtained from this web site sold without the express written consent of BALLOON ALOFT GOLD COAST, and where necessary, other information providers. Travel Agents selling Balloon Aloft Gold Coast product are explicitly allowed to use the material in their promotion of Australia, Queensland and Balloon Aloft Gold Coast directly by downloading from this site. Product and company names mentioned herein may be the trademarks or registered trademarks of their respective owners.